Vintage railway tickets from companies other than the LBSCR, LCDR, LSWR, SER and SECR including joint railway issues. A very odd title, BTN.& DYKE, & L.B. 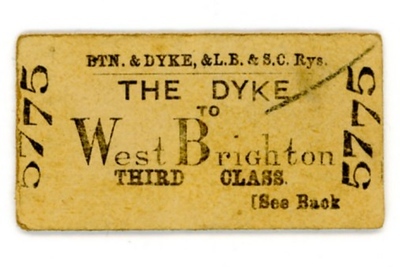 & S.C.Rly but basically an LBSCR third class single ticket from The Dyke to West Brighton dated April 6th, 1890.